Tamil Nadu Ambedkar Law University to release the TNDALU Rank List on their official website at tndalu.ac.in. 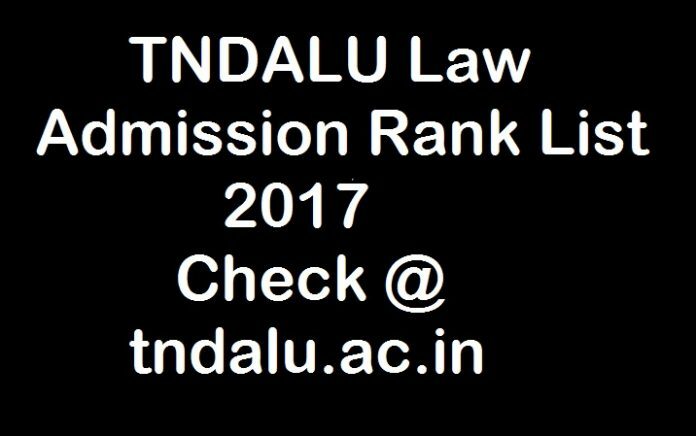 TNDALU 2017 Admission Rank List: The TamilNadu Dr B.R Ambedkar Law University has released TNDALU 2017 Admission Rank List on its official website at tndalu.ac.in. Candidates seeking admissions into 5 years courses like BA LL.B (Hons. ), B.B.A.LL.B. (Hons. ), B.Com LL.B. (Hons.) and BCA LL.B (Hons.) had registered on HSC basis. Now, students are supposed to download Tamil Nadu Ambedkar University Law Rank List from official website at tndalu.ac.in. As per the schedule, authorities uploaded TNDALU 2017 Admission Rank List in the official portal. The Minimum qualifying marks are 70% for General Category and 60% for SC/ST category for all five-year courses. Candidates to participate in the counselling procedure first of all check the TNDALU Law 5 years Cut Off Marks 2017 according to the category wise. Tamil Nadu Dr B.R Ambedkar Law University was established by the Government of Tamil Nadu by an Act of State Legislature. It was inaugurated on 20th September in the year 1997. The University has started its functioning in from 3rd Oct 1997. The University offers Law Degree courses at government law colleges in the State of Tamil Nadu. Vignesh K has topped the BA/BBA LLB with score of 100 on a minimum cut-off score of 97.87 per cent.